60 % of marketers believe visual content is essential to their 2017 marketing strategy. With shoppers increasingly heading online and away from bricks and mortar, brands and eCommerce retailers must look to their digital environment to translate their brand personality and visual merchandising into digital experiences. This year companies are planning to invest more in quality and engaging visual content with the aim of improving their brand perception and ultimately the buyer experience across all channels. With the growth of social media marketing, brands and businesses are starting to invest heavily in visual content strategy and assets to build their online brand personality profile. In 2016, 53% of marketers said they published content containing visuals between 91 and 100 percent of the time, an increase of 130% from 2015 and 91% of retail brands used 2 or more social media channels for engaging with customers and increasing brand awareness. However, while social media is an important and popular channel for visual content, it is important not to turn a blind eye to the use of engaging visual content in other channels, i.e. your email and websites. The visual content you use across social, web, and emails tells your story and guides your customers through your digital store doors and ultimately to the coveted Buy Now button. We've put together a list of popular visual content tactics that are sure to empower your brand and engage your customers in 2017! Lorna Jane, an Australian activewear company, is doing an amazing job on Instagram. They portray the personality and lifestyle of their target market through the pictures they post. In this case, a young, sporty woman that looks after herself when it comes to her looks and her health. Why not target your audience in a similar way? Create “Shoppable content”; any type of content (images, videos, articles) that provides a direct purchasing opportunity and allows the customer to move forward on the buyer’s journey e.g. click-through to a product/cart page to buy. With this, you not only show them something they would wish for but also give them the opportunity to purchase it straight away. Use guest bloggers, photographers, media companies, designers and video producing businesses to produce high-quality visuals for your social appearance. Social media sites are developing fast with always adding new functions to their platform. Live videos assure an authentic, real-time insight into your company culture. Make sure you always follow and study the upcoming new features and build them into your strategy! Every year Pantone selects a color that reflects the cultural direction and it influences all disciplines of design: from graphic design to fashion to interior decor. 2017’s color is Greenery, based on the growing attention towards our environment. You will see how much earth colors and green will influence online communication in 2017 next to a clean, minimalistic style. Join and follow the trend yourself! You have probably realized by now how extremely popular funny GIFs and memes have become on social media. Don’t be afraid to create creative ones for your business page, customers will appreciate it more than you think! Create a branded hashtag for one of your campaigns to be able to easily see and collect photos of customers using your products. You can also repost these images, which will further increase engagement since you are sharing real experiences from real customers. An amazing example is Emma Bridgewater's #EBspring campaign, which gained great popularity. Introducing your new feature, announcing your upcoming eBook or simply just recording a few “behind the scene” actions at your company can make a big difference in engagement rates. Start messing around with video construction programs such as Animoto and Shakr. Additionally, it's always good to extend your knowledge with online video production courses on Lynda. Doing several social media profiles for different purposes on the same platform, with different types of visuals, can help to increase engagement more specifically. See how the approach would fit your brand. 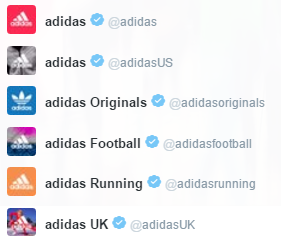 A great example of this is Adidas, where they successfully run different pages on Twitter for each purpose. How can Fresh Relevance help when planning a Visual Content Strategy? Integrate your social media posts into emails and web pages with the Fresh Relevance Social Media SmartBlocks that capture your content in real-time. Share your visual content in Triggered Emails to engage with your customers along the customer journey. Personalize your emails and web pages to make your visuals even more effective.